4,488 km raced at an average speed of 28.74 km/hr. 114 starters and 36 classified finishers. My apologies, but I have not yet found the team affiliations for most of the participants. Lucien Petit-Breton was by far the best rider on the all-powerful Peugeot team. 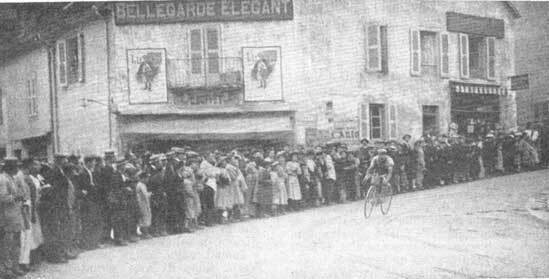 Petit-Breton won 5 stages and in only 1 stage did he fail to finish in the top four. Because riders had to perform their own repairs, Petit-Breton's excellent mechanical expertise served him well. 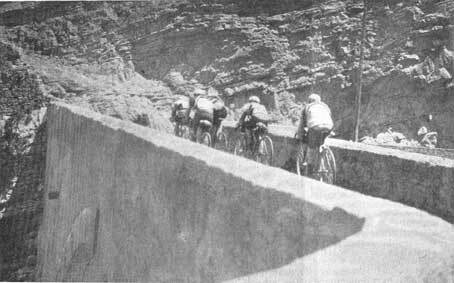 The 1908 Tour's General Classification was calculated using points. The 1908 Tour was the race's 6th edition. The Tour's enormous popularity can be seen in the crowds watching Jean-Baptiste Dortignacq roll through the town of Bellegarde. Dortignacq won stage 6. Jean-Baptiste Dortignacq, Georges Passerieu, Lucien Petit-Breton, Giovanni Gerbi & Maurice Brocco on the Saint Julien Bridge over the Verdon River in the Alps. This is during stage 6 from Grenoble to Nice. The current bridge on this site is not nearly as interesting. 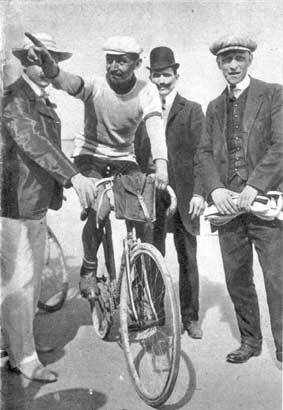 Winner of both the 1907 and 1908 Tours, Petit-Breton was a complete rider. 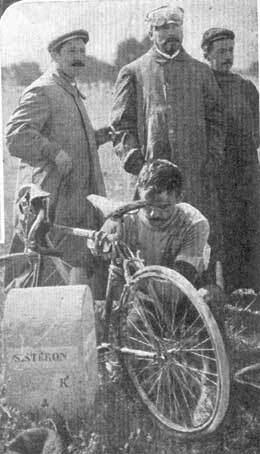 Gustave Garrigou repairs his own bike. Note that he is getting no help. Such assistance was forbidden. Note also the early caliper brakes with their huge mud clearance and that the rear wheel has 36 spokes.